Click thumbnail to view enlarged image(s) and color choices if available. Due to the nature of this custom-printed item, some variances in color or design may occur; the images shown are an approximation of the color and design. Please allow an additional 5-7 days for production including orders requesting upgraded shipping. Our cap is adjustable; one size fits most. 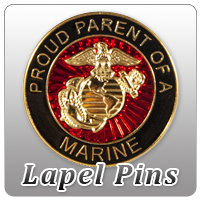 Red United States Marine Corps Cap - an EGA Shop Exclusive - perfect for a family member with a recruit in 1st battalion!